We are located in Godalming, not far from the Farncombe Boat House. 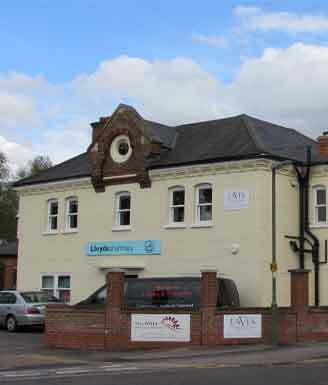 Our practice is in Catteshall Road, next to The Mill Medical Practice and directly above Lloyds Pharmacy. The entrance to The Eaves is at the side of Lloyds Pharmacy, to the right of their front door. Please do not park in The Mill Medical Practice Car Park. There is residential street parking nearby. Alternatively there is pay and display parking close by with approx. 50 spaces, to the right of the Leathern Bottle public house in Wey Court just off of Meadrow. Godalming is well served with regular services from Guildford, Woking, Farnham and surrounding areas. Most services stop on Meadrow, just at the top of Catteshall Road (approximately a 5 minute walk). Services 42 and 72 stop directly opposite The Eaves. Godalming train station (London-Portsmouth line) is on the opposite side of the High Street and is a 25 minute walk through the town to Catteshall Road. Taxis are available directly outside the station for the 5-8 minute drive. Alternatively, Farncombe train station is a 14 minute walk.